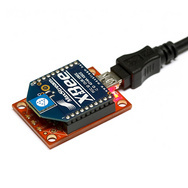 The Xbee is mounted in a Sparkfun Xbee Explorer USB module which contains an FTDI USB-serial converter and presents itself as an additional serial port to the Omnima embedded board. The Omnima can then open and access the serial device in order to send and receive data via the Xbee network. In the Languages menu select Python, Python-mini and Pyserial. In the Kernel Modules menu select kmod-usb-serial and kmod-usb-serial-ftdi. In each case you should build them as modules using ‘M’ rather than ‘*’ as you don’t want to increase the size of the kernel image due to the limited flash on the Omnima device. Building as modules keeps the flash kernel image size down, but still allows you to load the modules later from a USB or other filesystem device. This should install the appropriate devices for communication with the USB-serial converter on the Xbee carrier board. You can confirm by inserting the Xbee carrier module cable into the USB port, and viewing the output of dmesg. You should see a note that it has created the TTY device “USB0”. With this in place you are ready to write an application which can talk to the Xbee module. You can use any programming language for your application which communicates with the Xbee module via serial, but for the purposes of this example we will use Python together with the Pyserial module. "ImportError: No module named termios"
This is because the serial module is removed from the default python-mini installation, in order to keep its size down. We can get around this, however, by pulling in the file from the full Python package which we built earlier. We simply copy the termios.so module from the full-blown Python build which still resides on the development PC onto the target device’s python-mini installation directory. Note that the ipkg/python folder contains the full Python tree, while ipkg/python-mini contains the cut-down package tree. You can compare the two to see which other modules have been removed from python-mini. After having copied termios.so on to the target, you should now be able to SSH into the target, run the python command and import the Pyserial module using import serial. This uses the Xbee module’s default baudrate and other serial settings. Further details on how to write Pyserial applications are available from its homepage. This script should be stored in the /etc/init.d folder, and once created should be made executable using chmod +x /etc/init.d/myapp. You can now run /etc/init.d/myapp start to test your application is successfully started by this script. Once you are happy with the script, you can make it autorun at boot time using /etc/init.d/myapp enable. You can now reboot the device and check that your application was started. You may find that the python-mini package is missing some key modules required for the applications you wish to write. If you find this is the case then you can use the same method described above for adding serial/termios support. Whenever python-mini complains of missing modules, you can copy them from the full-blown Python install on your development PC. The missing modules are generally .py files (for example smtplib.py) in the ipkg/python/usr/lib/python2.6/ folder, but in some cases (as with termios.so) they are compiled object modules in ipkg/python/usr/lib/python2.6/lib-dynload. This entry was posted in HowTo and tagged Embedded, Home Automation, Kamikaze, Linux, Omnima, OpenWRT, Python, Xbee, Zigbee. Bookmark the permalink.